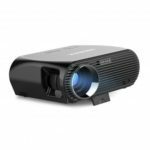 The MIJIA Projector comes with 2.07 million reflective lenses and utilizes a new light-path design to increase projection brightness by 5%. It is crammed with OSRAM’s P1W/A lamp beads which is used to achieve a brightness of 800 ANSI lumens. This ensures users get crisp clear viewing experience during the day. The lamp has a shelf life of up to 10 years. 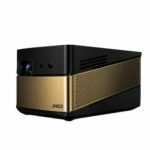 In addition, the Mijia Projector supports HDR10 high dynamic range video decoding, which makes the brightness and darkness of the picture clearer. 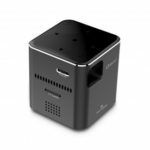 Xiaomi Mijia Projector achieves auto focus and clear picture will appear in front of you in 3 seconds after started up; which is different from traditional manual focus projector. There are more than 2.07 million 5.4um retroreflective lenses on a small chip. Each lens like a small mirror. It flips 17 degree more or less independently at a frequency of 166,600 times/second. It converges different color beams onto the lens for you. Presenting HD pictures. Create theater and game room in your home. 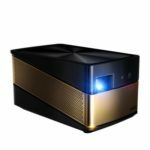 Xiaomi Mijia DLP projector throws 40-120 inch huge picture in the wall. You can watch 1080P and even 4K HD videos. It is time to experience shocking visual feast beyond the TV at home. Xiaomi Projector new light path design increases the brightness by 5%. Osram P1W/A lamp bead adopted along with 800 ANSI lumens prevent picture distortion. Brings you wonderful watching experience even in daytime. 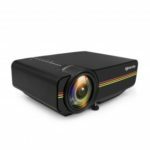 HDR10 high dynamic range video decoding technology enhances the picture contrast ratio. More vivid color, more real object and wider color gamut, bring you a better visual experience. Not only shocking visual experience Xiaomi Projector brings, it also pursues the theater stage sound effect. 2 inch 10W double horn double passive film soundbox adopted, give you immerse feeling. Mijia projector supports both WiFi and Bluetooth wireless connection mode. It can be used as a Bluetooth speaker and capable of connecting multiple Bluetooth devices at the same time. With 1.1:1 throw ratio, Xiaomi Projector throws a large size picture in a very short distance. Put it at the corner of a desk or on the floor at random. 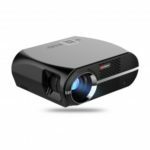 + / – 45 degree keystone correction function remove the limitation of traditional projector that has to be placed right against the curtain. Equipped with HDMI 2.0, USB 3.0, and 3.5mm audio interface, enable to connect various external devices, bringing you more entertainment.